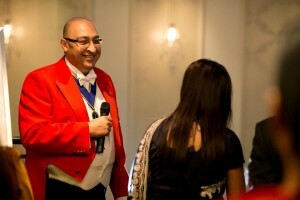 Working as a Hampshire Toastmaster was Fabulous!! Recently I attended Warbrook House in Hampshire, a delightful venue that lends itself to having a Toastmaster for weddings. It was fabulous being a Hampshire Toastmaster for a day. As usual on open days like this, young couples attend to gather information for their big day with plans at hand they come across me, ToastmasterJango. They’re often a little perplexed when they see me in my full red-coated glory. On most occasions they smile and look a little puzzled as to how and what I can do for them on their wedding day, which is when I introduce myself with a ‘Good Morning I am ToastmasterJango’. I then explain to them that part of my work is to ensure that they and their family have a stress free day, organising and safeguarding that the right people are in the right place at the right time. Now, this may seem like a quite simple task but when you break it down only a professional Toastmaster with his experience can ensure your day runs to time, without any hitches or glitches. After all, it’s what we do and I’m the no1 toastmaster in this regard! eat their amazing meal, he has cheked that the catering is ready, the photographer is set and the videographer is ready to capture that special moment when the bride and bridegroom make their entry. This is where a professional Toastmaster comes into his own ensuring that everyone is ready for that special moment including the Bride, Bridegroom and respective families. Without guidance, time will always over run at any wedding function the Toastmasters job is to ensure that everything runs to schedule. He will always be 10 minutes ahead of the day making sure that everyone is informed of what is coming up next and ensuring that everyone is ready and that all the guest are kept informed as well of the day’s proceedings. I always say that if you ‘get it’, you will book a professional Toastmaster; it’s like having an insurance policy that everything will be perfect on the day. Booking Jango as your Toastmaster guarantees you Perfection!!! My planning, expertise, patients, care and genuine understanding is why I’m so highly rated by everyone that has booked me for their event. It leaves you with peace of mind that you will have a day to remember for the rest of your married lives.